Today we are featuring Kim Mapel and since today is Valentine’s Day we asked Kim to share some Wife Wins in her life! So Kim, tell us about yourself and your beautiful family in the photo. 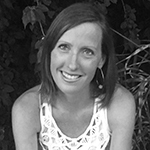 I am an Organizational Psychologist by training, a homeschool mom, a small business owner, and a Bible LOVER. This is a picture of my family. Bahahaha. How long has your husband been married to a circus clown? 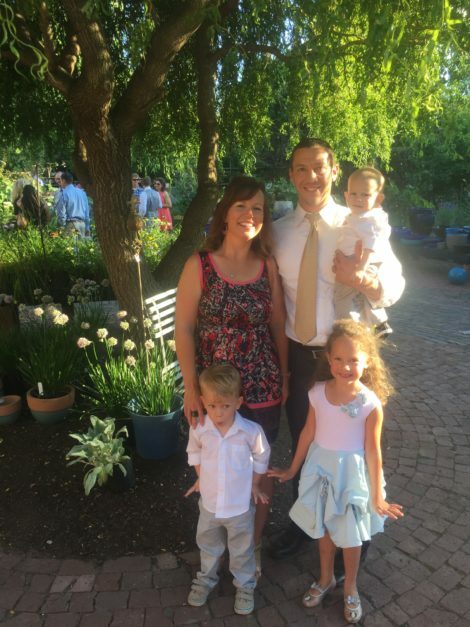 Brett and I have been married for ten years, we are blessed with three children on earth. Halle Lu (named after Hallelujah) is seven and is a miracle child for us. She is IN LOVE with her brothers. Graham is one and off-the-hook happy as long as he has had his naps and his snacks. He is also our first child who only has eyes for his Daddy. We have five beautiful heavenly babies we long to meet one day. Oh Kim, that is a beautiful description of your family. It truly will be so sweet to all be united in Jesus’ presence one day. Do you wear any other hats in addition to your [big, gigantic, hugely significant] Mom Hat? Besides being a mom, I CANNOT even wait to become a Grandma someday! I serve my husband, as a wife who is learning to submit. I humbly serve many trusted family and friends in my wellness business. I also serve in Women’s Ministry at my local church where I have led Bible studies for seven years. I am a passionate home educator because I think learning is SO stinking fun. I will be a life-long learner and I pray my kids are, also. You can often find me reading 3-5 books at a time. Wow, you sound energetic! Tell me about your wellness business. I have learned so much about healthy eating and nutrition through the years, particularly during our long season of infertility. I love helping friends work toward their best health. I share a bit of my story here. But the business and busyness of raising children takes so much out of us as moms, how do you prioritize your husband? I think the short answer is: I am a woman who takes God at His word. God commands me to LOVE. My job is to obey. Right. And love is a choice more than it is an emotion. Throughout our marriage I have heard God speak to my heart: “Kim, the world will know you by YOUR love.” My love for God and my love for people. If I cannot love my own husband, who can I love? Gulp. So because God’s voice gently reminds me of my role, I seek His strength to fully love my man. Even during sleepless nights when nursing a baby? Yes. God has answered my prayers to increase my desire, to increase my energy, to help me find greater enjoyment, to help me see my husband as the blessing he is, and to keep short accounts. Keeping short accounts of differences has led to greater enjoyment in the bedroom because my heart can be clean before him. Wait, exactly how has keeping short accounts with your husband led to intimacy in the bedroom? God has helped me speak gently and honestly about concerns I have had. Addressing these things helps me avoid roots of bitterness. For example, I have seen my husband behave in such a way that led me to conclude he is quick to judge. Suddenly I find myself being resistant to loving him as he deserves, physically speaking. So then what do you usually do next? For instance, one day he came in from the office and said something regarding the dinner I had chosen to prepare. It was not loving or kind. If I can soak myself in those truths, I can keep perspective. “Called to be together, to usher each other into Jesus’ arms…stronger together.” That does bring things into perspective. Yes, and when I have the right perspective, I can love him out loud. To do that I ask God to give me a greater desire to serve him, to bless him, to communicate with him, and to satisfy all of his needs. To satisfy all of his needs I have to know his needs. I ask him about his needs, sometimes via text messages which usually gets both of us very giggly and filled with anticipation. More blushing. But good stuff to think about! Wow, Kim, what good reminders this Valentine’s Day. Thank you for being so honest, vulnerable and thoughtful to share what has helped you love your man out loud! Do you have any words of encouragement if this is a tough subject for some moms? If there are moms out there looking for soul healing encouragements in this area, I strongly recommend the following books: Boundaries by Drs. Henry Cloud and John Townsend and Sheet Music by Dr. Kevin Lehman. These books were pivotal in my journey in this area of my life. Boundaries taught me to communicate openly about my needs. After getting married and having normal fears and hesitations, I can tell you this book really helped me verbalize things that I like or do not like. It gave me peace and freedom to share openly. Brett and I have had many vulnerable and honest conversations that have improved our bedroom time. The investment into these books and awkward conversations has allowed our time to be mutually beneficial. I speak to many wives who have not had the courage to have these same conversations. This has been the key to making my time very open to his needs because I know he desires to SHARE in the experience. I know he cares about my needs, my joys, and my delight in the process as well. Above all else, prayer. God wants us to keep our marriages alive in this manner. This was His design, it is not dirty or wrong. It is an act of worship and a way for husband and wife to delight in each other. It’s vulnerable, yes! Within the safe confines of a trusted companion, it is beautiful. Yeah, I don’t think my husband and I had any idea what we were getting into when we first got married! Haha. Exactly! When we got married, I kinda thought we had marriage figured out since we’d read some good books and had some good counseling (which thinking about it now is truly laughable that I was so naive!). That’s so true. Maybe instead of attaining perfect, we strive for connectedness? Staying connected and on the same page is a lot harder than I envisioned and certainly doesn’t always match my pre-marriage idealistic expectations. Like – my hubby is a very hard worker and so sometimes he has trouble getting home in the evenings at the time I think he should. I envisioned sweet family dinners every night where we talked about our highs and lows..oh, and ate our food calmly. HA. 😳 Not so much in our house as of yet. Those picture-perfect dinners just aren’t a reality at our house every night either! You know, before we got married, I think I kind of assumed my hubby and I would agree on everything. From little things, like what time we’d like to go to bed at night or get up in the morning – to big things, like how to address different situations with the kids … reality is, we just don’t always see eye to eye on those things. When the day-to-day realities in our marriage don’t match the picture I had in my mind of what marriage should look like, that can start to create a barrier between me and my hubby. Ouch – I’m guilty of those passive aggressive comments, too. And I’ve learned that sometimes my expectations aren’t met because I don’t communicate them well to my husband. Can’t expect him to know if I don’t tell him! But, sometimes I need to reevaluate my expectations. So when my expectations aren’t met, how can I address my own heart issues before God instead of rushing to blame my husband? Right. In those moments I do need to give my husband the benefit of the doubt, like I hope he would do for me. Then, I need to take my hurt feelings and unmet expectations to my Father. Yes! I love when we sing that song at church!😍 And you’re right. My marriage may not look exactly like I thought it would before we got married. My expectations and longings may not all be met through my husband. It’s just not possible for him to meet all my needs (and goodness knows, there is NO way I can meet all his either!). 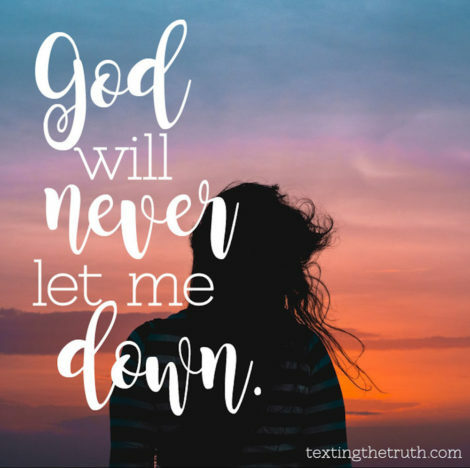 But, God will never let me down. He is always faithful, and He will always provide for my deepest needs. For sure. And sometimes I think God allows challenging seasons when we may not totally be connecting with our hubbies to draw us closer to Him and depend completely on Him. And when I depend completely on Him, I can trust that – whether I can see it in the moment or not – He is always doing a work in me, in my husband, in our kids, and in our family. And He will be faithful to complete it! So what you’re saying is – I need to be honest about my expectations with my hubby on what I may want for the day and if it’s not met, give him the benefit of the doubt and lots of grace? And how about going to God with my heart’s desires first? Yes! That! And let God fill any empty spaces in my heart. On Valentine’s Day and on the days that follow! Click here for more song suggestions. There are so many great ideas in the books we listed above. We have found them helpful in understanding how and why our expectations may be different than our hubbies’ – and how we can best respond to those differences. We’ve learned (the hard way) that when a conflict arises over unmet expectations, it’s best when we take a little time to cool off ourselves and pray before we address the topic with our husbands. But, we’ve also learned to not wait too long to talk it over … or the resentment will start to settle in. Still learning to find that balance in timing! We always include this statement below 👇 about professional help – and it is perhaps especially true in the realm of marriage relationships. If we are having difficulty communicating with our spouse or reaching an agreement about expectations, we really benefit from some outside counsel and insight. We speak from personal experience that sometimes you need counsel to help you set you on the right path again.